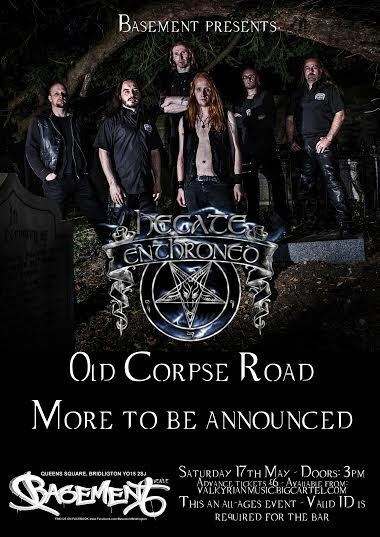 British folklore-inspired black metallers Old Corpse Road have been confirmed to support Hecate Enthroned at their first show in East Yorkshire in over three years. The show will take place at Basement in Bridlington on 17th May 2014 with more support acts to be confirmed. Tickets are available for £6 from this location. Anyone know follows the British black metal scene will have no doubt encountered the legendary, if somewhat unsung, heroes of the scene: Hecate Enthroned. Following the release of Redimus in 2004, the band have remained fairly quiet – or as quiet as you can possibly get when playing black metal. However, following their recent pact with Italian label Crank Music, Hecate Enthroned are set to rise again. The eerie orchestration of Thrones Of Shadow acts as the beginning of the ritual that is Virulent Rapture. The haunting orchestration leads into the fierce wailing guitars and bestial vocals, as the keyboard passages create a Poe-like atmosphere that glides gently between the crushing use of guitars, bass and drums and the hate-flavoured vocals. Unchained sees the waves of Plutonian darkness continue to flood forth from the snarling guitars and hypnotic keyboard medleys whereas the bass and drums are more thunderous and barbaric, creating a perfect contrast. The introduction of Abyssmal March creates an atmospheric mood, painted with varying Cimmerian shades but the unrelenting charge of the heavier instrumentation rushes in, leading a vicious use of screams and Hadean keyboard medleys. Plagued By Black Death features a melancholy piano passage which dances like a spirit at dance macabre with the vocals and guitars in a certain, almost seductive manner portraying beauty and a bestial nature in one vessel. Euphoria explodes in like a volcano, domineering one’s hearing with a visceral assault of guitars and drums and some heavy punches from the vocals. The guitars whip out melodic passages, which are accompanied by a mystifying layer of orchestration. Virulent Rapture is a flood of guitars on a biblical scale of proportions, leaving nothing but a path of ruin and devastation – and probably some sore necks as well – in its wake. The hypnotic orchestration does little to sooth the destructive nature of the song, in fact, it enhances it in a dark and ethereal manner. The one calm during in the storm is produced by the haunting guest vocals of Sarah Jezebel Deva who adds an enchanting element to the song. Life comes across as more of a gothic doom anthem, lending an obsessive, memorable and augural sound through the shadowy voices of the guitars and illusory keyboards. The stern use of bestial vocals do contrast away from the music, employing a strong black metal element there. The alarming riffs of To Wield The Hand Of Perdition leave no room for mercy as they tear their way through the song like wolves hunting their prey. The vocals are formidable at each turn, while the rhythm sections made up by a terrifying assault of drums and bass, alongside the keyboards, strengthen the track. Of Witchery And The Blood Moon, a title that rings true to the band’s name, is somber in its presentation, painting an image of an unrelenting arctic winds, leaving only a cold trail of wintry enchantments. Immateria is a break from the fierce snapping of riffs, lyrical war cries and barbaric percussion assaults, taking the listen sailing down a more gentle river of memorable medleys until Path Of Silence unleashes a storm of deathly riffs and vocals sharp enough to cut steel in two. The percussion and bass falls down heavier than a ton of bricks, finishing off the devastation left by the previous tracks. The keyboards and orchestration finalise the black metal incantations, keeping the band’s signature sound unscathed throughout the chaos. Raise your horns and bend your knees. The kings of British black metal, Hecate Enthroned, have returned with a masterpiece that has not only become a complete evolution of their sound but proves that they are one of the best bands on the scene and they certainly show no signs of abdicating from their throne just yet. With the impending release of Hecate Enthroned’s latest masterpiece, Virulent Rapture, on the horizon, the legendary black metal coven have posted a track from the album to YouTube as a teaser, so fans can get an idea of what to expect from the new album. The song can be heard below. The song, To Wield The Hand Of Perdition, is a completely new direction in the band’s career, focusing less on the symphonic melodies – though they do remain – and more on a crushing assault that will render one’s ears bloody. Virulent Rpature, the new long awaited album from unsung black metal legends Hecate Enthroned, is now available for pre-order but is limited to 100 hand numbered copies that will include an A3 poster and the Hecate Enthroned flag. Pre-orders can be made at this location. Virulent Rapture will be released on 25th November via Crank Music Group. Created 16 years ago by David Homer, Apparition have sailed through the UK’s underground scene, supporting more well-known acts such as ReVamp, Delain and Sarah Jezebel Deva. With a performance coming up at The Dames of Darkness Festival and their recent album released through Ravenheart Music, David Homer, bassist for Apparition has a chat with Valkyrian Music’s Nico Davidson. Nico: Your album For Vengeance… And For Love… was released recently, what are the main concepts on the album? David: They are just different stories sang to music. No real concept except maybe ‘freedom’. Nico: How does For Vengeance… And For Love… differ from previous Apparition releases? David: Well, I was the only person on this album that was on the debut Drowned in Questions. The songs on For Vengeance are a lot heavier, better production because we took more time and I did the keyboards on all but two of the songs. I visited this keyboard player called Adam a few years ago and by watching him picked up tips on how to be creative with the keys instead of just playing simple chords. Thankfully, he is in the band now. Nico: You’re playing the Dames of Darkness Festival in May. How are you feeling about that? David: As we are hosting the show I am just hoping it all works out and that the bands and fans leave happy with good memories. If it is a success we might do others. Nico: I understand you’ve shared the stage with Delain in the past. Are you looking forward to sharing the stage with them again at Dames of Darkness? David: Yes because when we played with them the first time I didn’t really know them or their music. When I watch them this time it means the day is nearly over and I can relax. Nico: How would you say that Apparition differs from the other “female-fronted” bands on the scene? David: We are classed as symphonic metal and goth metal and we use live keyboards and not backing tracks like most bands both big and small. I feel there is enough creativity in the band to show that we don’t need orchestras or choirs. Not to say I don’t like bands that do have these parts because I do but it’s just not for us. Nico: How would you describe your music to a potential fan? David: If we jammed without vocals and keyboards we could be seen as a Metallica type band. By adding Sakara’s [Apparition‘s new frontwoman] wonderful singing and Adams keyboards we give the music atmosphere and feeling. Nico: Apparition have played a number of different shows, some of which have been in support of acts like Sarah Jezebel Deva, ReVamp and Tarja Turunen. Which show would you say was the best one you’ve played? David: My favourite show by far was with Sarah Jezebel Deva in Liverpool. We were really tight and had so much energy that night. The Tarja show was good because we played in front of many people and it was good to meet the lady herself. Nico: Aside from the aforementioned Dames of Darkness Festival, what other plans do the band have for 2013? David: We’re going overseas to play again. Last year we played at Angels Rock festival in Belgium with Azylya and ExLibris which was very cool. Before that we need to work hard at practices with new guitarist Nick and hopefully new drummer Alex. Nico: What’s the meaning behind the band’s name, Apparition? David: There isn’t one, it just sounds right for a gothic kind of metal or rock band. Nico: Excluding yourselves, which band from the UK would you say are the best on the current British metal scene? David: I am not saying this because we toured with them but I really love Sarah Jezebel Deva‘s band because they have great songs. Each night after we played I would still enjoy watching them even after ex amount of shows. Also Saturnian, a symphonic black metal band we played with at the Liverpool show were amazing. Everyone who knows our then guitarist Owen will tell you he never shuts up BUT he was quiet for about the 30 minutes that they played. At first we thought he had gone to the lap dancing club next door but nope, he was transfixed! Nico: Thanks for your time, David. I look forward to seeing you all at Dames of Darkness in May. Once again, Shades Nightclub in Bridlington will play host to Valkyrian Festival on Friday 29th and Saturday 30th November and Sunday 1st December. The event, organised by Valkyrian Music editor Nick Taylor – who is better known by his pen name Nico Davidson, aims to raise money, this year, for RapeCrisis. Also, confirmed alongside Nya and Narcotic Death is the UK’s finest folklore-orientated black metal overlords Old Corpse Road. The five-piece outfit have written a dark and brooding legacy over the years they’ve been on the scene and have taken their heathen anthems to some of the UK’s premier festivals such as Bloodstock, Warhorns and Metieval. With a vast collection of mystifying compositions, it will be witching hour at Valkyrian Festival when Old Corpse Road take to the stage. And for fans of bands such as Nightwish, Sarah Jezebel Deva and Delain, Worksop-based operatic metallers Aonia will also be returning to the Valkyrian Festival stage. Described as “England’s answer to Finland’s Nightwish and Sweden’s Therion”, Aonia are excited to be bring their own unique style to Valkyrian Festival. Valkyrian Music have also organised a Battle of the Bands where the winning band earns themselves a slot at the festival. The single round BOTB will take place on Saturday 27th April at Shades Nightclub, Bridlington. Confirmed to compete so far are Lipstick Sunbeam, Seconds Apart and Fallen Angel. The winning band will determined by the audience and tickets will be available on the door for £2. Weekend tickets are available for pre-order via Valkyrian Music’s BigCartel store and are priced at only £5 each (excluding postage and packaging) and for those who like to keep the party going, there will be an after party each night at Shades Nightclub which will be free for all ticket holders (£1 for non-ticket holders). The after parties will be DJ’ed by resident DJ Steve Hall, who plays only the best in rock and metal and to sweeten the deal, there will also be give aways and raffles at the event. There is also an active JustGiving page set up to help raise money before and after the festival. The JustGiving page can be found at this location. Nya’s latest EP, Drivin’ The Nails In, was released 5th November and is available from their BigCartel store. Narcotic Death are also taking pre-orders for their upcoming album Dies Irae, which can be pre-ordered from their BigCartel store along side their new line of t-shirts. Shades Nightclub in Bridlington will be the host for this year’s Valkyrian Festival, following the closure of The Lamp in Hull earlier this year. The annual event, organised by Bridlington-based webzine Valkyrian Music, is in aid of UK charity Autism Plus. Valkyrian Festival will take place on Friday 23rd and Saturday 24th November, with doors on the Friday night opening at 6pm and at 2:30 pm on the Saturday. Bridlington’s own deathcore titans in the making Sea Of Giants will headline the Friday night, with support from Riff-X, Illflower, Dead Pools and Gloomlurker, whom supported ex-Cradle of Filth backing vocalist Sarah Jezebel Deva, earlier this year in Grimsby. Saturday will be headlined by Birmingham prop-power metallers Dakesis, who supported Edguy earlier this year and played an exclusive acoustic set at Bloodstock back in August. Joining them, as main support will be Ziyos and fresh from Bloodstock’s New Blood Stage, will be Hull’s premier misanthropic black metal outfit Infernal Creation, who blasted their way through Bloodstock this year on the New Blood Stage, along with special guests Sanguine,whom rocked Download back in June. 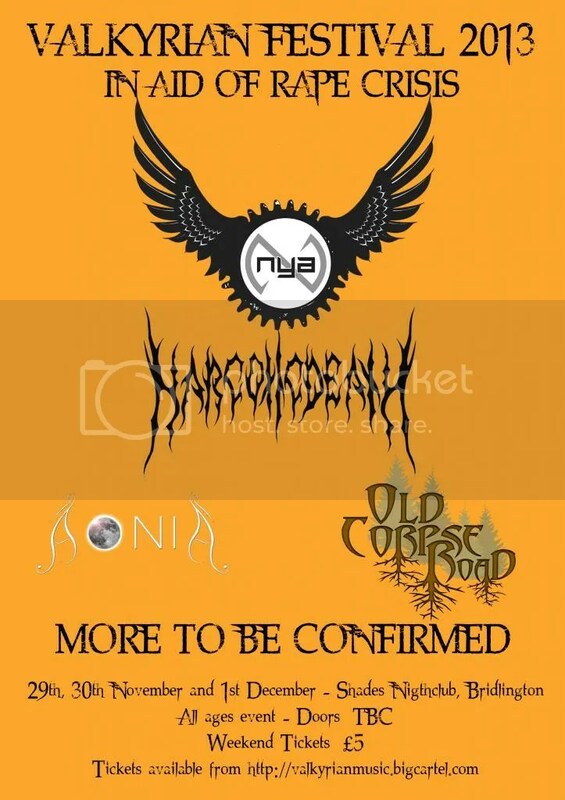 North-west metal bands Nitronein and Shades of Avalon will also be joining Dakesis as supports, along with female fronted operatic metal outfit Aonia who will be playing a rare and exclusive acoustic set. Engraved in Blood and Organized K-Hos will be completing the line-up for Saturday, as well Apparition, who will be playing with their new frontwoman, following the break after their tour with ex-CoF backing vocalist Sarah Jezebel Deva. Weekend tickets are priced at the low, low, low price of £4 and are available here. Day tickets will be available on the door. All proceeds will go to Autism Plus (Register charity no. 518591). The event is all ages, with alcohol available from the pub above the venue. Poster designed by Dark Creative 32.